Search results for: "liz gonzalez"
like a luchador in an apron, ready for a match. the full-moon tortilla into an iron pan. until the tortilla blisters, crisps. pick it up with both hands, and take a bite. The buñuelo breaks into a twenty pieces. SOURCE: An earlier version of “Buñuelos” was published in Art / Life, August 2001m and Lummis Day Souvenir Program, June 2008. 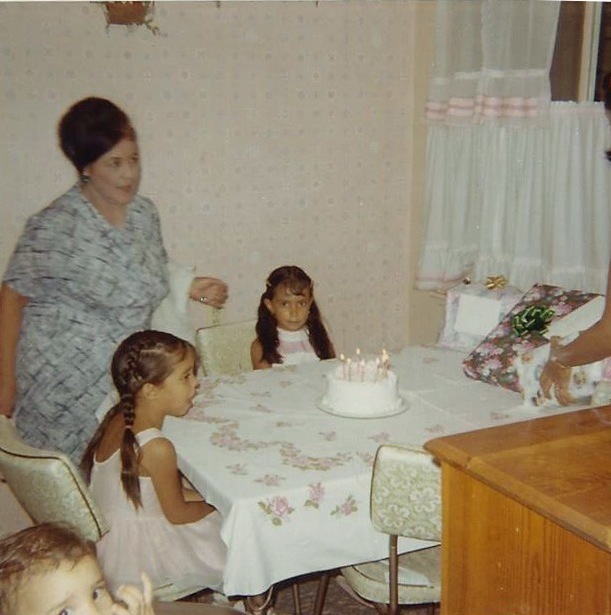 PHOTOGRAPH: lizzy’s eighth birthday, August 22, 1967. AUTHOR’S NOTE ON THE PHOTO: This is my eighth birthday celebration in the kitchen of my childhood home. In the picture are Grandma, my sisters Cynthia (older) and Michelle, and me. It was the last year I celebrated my birthday alone. Monique, my baby sister, was born the next year on the day before my birthday and to this day we celebrate together. NOTE FROM THE AUTHOR: When my father died, I was three and my baby sister had just turned one. My maternal grandmother, who helped run her parents’ market as a teen and then ran her own family market, quit working at 53 to be our second mother while my mother and grandfather were at work. For seven years, even after my mother remarried and had two more daughters, Grandma took care of us during the day and remained our second mother until she passed five and a half years ago. She said that those years were some of the best years of her life. During those years, she taught us how to make traditional Mexican food, like tortillas, mole, and buñuelos. My sisters, mother, and I will always be grateful to Grandma. and crunch Chihuahuas like taquitos. my cream and caramel Jack Chi. stuck seeing the same houses and streets. and make a quick escape. past the squeak of bobbing oil pumps. I’m breathless; Chacho’s ready to run. Park’s rim and Panorama Drive. sail by artificial THUMS Islands. ready to do some heavy lifting. Salt and sage scent the breeze. on swollen prickly pear fruit. while I stand in awe of the view. Catalina Island on a fog-free day. White sunlight rides the ripples. Chacho nibbles on corn bread. 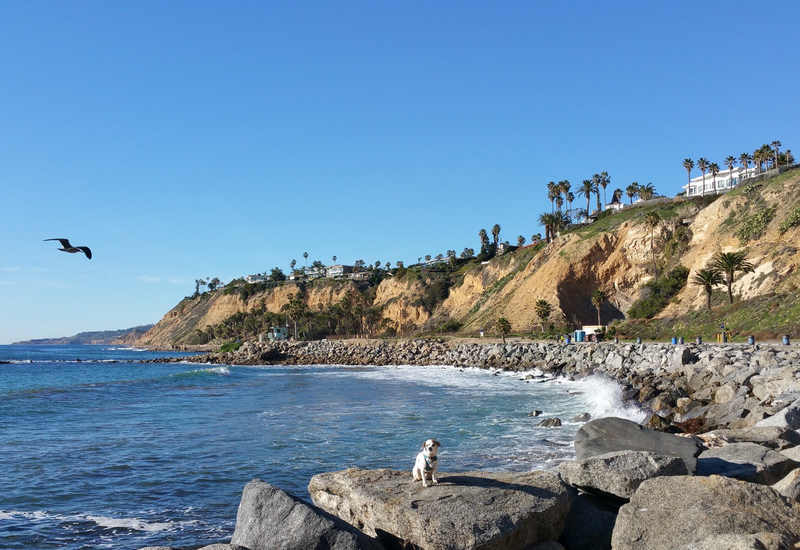 PHOTOGRAPH: “Chacho at White Point Royal Palms Beach” (San Pedro, California) by liz gonzález. 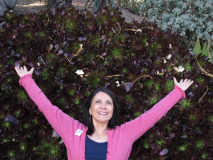 ABOUT THE AUTHOR: liz gonzález is a fourth generation Southern Californian. Her poetry, fiction, and memoirs have appeared in numerous literary journals, periodicals, and anthologies. She has poems forthcoming in Wide Awake: The Poets of Los Angeles and Beyond and is the author of the limited edition poetry collection Beneath Bone. liz’s awards include an Irvine Fellowship at the Lucas Artists Residency Program and a Macondo Foundation Casa Azul Writer’s Residency. She works as writing consultant and teaches creative writing through the UCLA Extension Writers’ Program. Visit her at www.lizgonzalez.com.